Bulgaria is gaining momentum as Southeastern Europe’s entrepreneurship and innovation hub, as well as an IT powerhouse. Bulgaria is leading Southeastern Europe’s digital economy as a hub of entrepreneurship and innovation, particularly in the information technology sector, according to the country’s top envoy to Korea. “A vibrant, inclusive and supportive startup ecosystem has been developing in Bulgaria for the last 5 years involving various stakeholders, including pre-accelerators, accelerators, venture funds, business angels, co-working spaces and startup nongovernmental organizations,” said Bulgarian Ambassador to Korea Petar Andonov at a roundtable event on Friday at Pangyo Startup Campus, Gyeonggi Province, which explored partnership opportunities between Bulgarian startups and Korean IT firms. In addition, he said, the nation’s capital Sofia was among the top 10 places to launch a startup in the world in 2016, citing a report by Forbes, as the city offers one of the lowest corporate tax and personal income tax rates at 10 percent. Sofia also boasts internet speeds among the fastest in the world. Pointing to the success of Bulgarian startup Imagga Technologies -- a global company with an office in Seoul and offering cloud-based application programming interface platforms for automated imaging and video-tagging -- the ambassador said the two countries were the best entry points into their larger regional markets. Imagga Technologies deals with more than 200 different types of businesses and employs 10,000 developers across 82 countries worldwide. 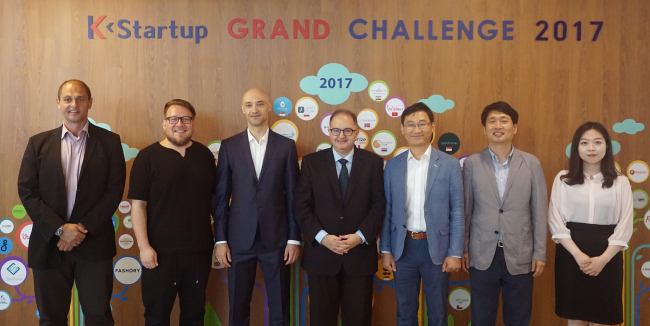 It finished fourth place at K-Startup Grand Challenge 2016 competition in Seoul, and in the same year, won the “best startup for artificial intelligence development” category at the Central European Startup Awards. “Bulgaria is already a regional hub for information communications technology,” said Stamen Kotchkov, chairman of the management board at the Bulgarian Association of Software Companies and vice president of SAP Labs Bulgaria. Emerging Bulgarian enterprises in the field include Telerik, Bulpros Consulting, Imperia Online, Nemetschek Bulgaria, Scale Focus and Melon Technologies, he added. Kotchkov said global ICT corporations have chosen Bulgaria to reap benefits from its deep pool of talent, strategic location connecting Europe and Asia, political stability, long tradition of excellence in ICT, vibrant ecosystem, advanced IT infrastructure and network, as well as competitive business and living costs. In Bulgaria last year, according to the Bulgarian Association of Software Companies, 420 startups were created, 70 percent of them in the services sector and half of them in the IT sector. Bulgaria’s IT industry is largely business-to-business oriented and offers products and services for digital marketing and software development, encompassing cloud systems, platform integration, device connection, process automation, machine learning as well as analytics and big data. The industry employs some 100,000 people, including 22,000 software engineers, whose salaries are several times the national average. “One of the four priorities of our Council of the European Union Presidency this year was related to developing our digital economy and skills for the future, which are indispensably linked to the EU Digital Single Market and access to innovation,” said Andonov, referring to Bulgaria’s rotational presidency in the first half of this year. The presidency bore fruit on a number of fronts, including the Audio Visual Media Services Directive, European Electronic Communications Code for developing high-speed broadband networks, and European Regulation for Electronic Communication. On June 25, the European Commission launched the Digital Agenda for the Western Balkans -- Albania, Bosnia and Herzegovina, Kosovo, Montenegro, Macedonia and Serbia -- with aims to engage and incorporate the outlying countries into the EU’s fold digitally. The European Commission and the six states jointly vowed commitments to investing in their broadband connectivity; strengthening cybersecurity, trust and industrial digitalization; fostering the digital economy and society; and boosting research and development on digital infrastructure.